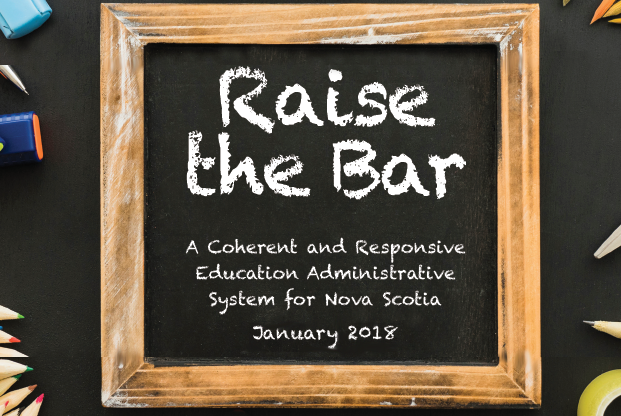 In 2017, the Province engaged an independent consultant, Dr. Avis Glaze, to conduct a comprehensive education system administrative review of Nova Scotia’s education system. The purpose of the review was to look at how Nova Scotia public schools were administered, including the role of elected school boards and their central office administration, and the administration at the Department of Education and Early Childhood Development. The review explored whether we have the best system in place for the ultimate benefit of our students’ success. View a recording of Minister Churchill’s announcement. Read government’s response to the “Raise the Bar” report. Minister’s directive letter to governing (elected) school boards. For more information about what Dr. Glaze heard during her review and the recommendations, read her report Raise the Bar. View a recording of Dr. Glaze’s announcement. "On March 1, 2018, Zach Churchill, Minister of Education and Early Childhood Development announced the Education Reform Act". View a recording of Minister Churchill's announcement. Read the news release and learn more by reviewing the Education Reform Act presentation. Comments and questions relating to the review can be directed to: educmin@novascotia.ca.